Continental has changed its standby policies to give passengers a bit more flexibility (for a price). For a $50 fee ($25 if you’re gold or platinum), you can change your flight to any other flight that is scheduled for within 12 hours of your original flight, provided you do it within 24 hours of your original flight time. The good news for Continental flyers is that it can also be 12 hours after the original flight, which was not necessarily the case before. Yes, they’re charging more for this service (ah the days of free upgrades), but having that flexibility is useful, especially for business travelers. While the new policy offers great flexibility, it comes at a cost. CO has eliminated free standby entirely, as they previously allowed within three hours of one’s flight. While CO tries to spin this as an enhancement, they’ve been quiet about it, and for good reason– they’re providing a new service at the cost of a key existing one. 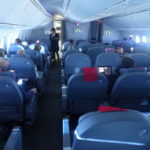 Delta announces new award thresholds! Disappointing that they would charge elites for that! Delta lets you do SDC for FREE! However, Same Day Confirmed allows you only to make the change within 3 hours of the new flight given that it is the same calendar day. CO’s decision of 12 hrs on either side is good and bad. For people taking a redeye and wanting to switch off of it, often a 6am departure (thinking of coming in from SEA) wouldn’t work because it would be more than 12 hours before the original flights.